Hi, I am interested in your 1967 Plymouth Satellite (stock #4942-CHA) listed on Autotrader for $31,995. I'd like to get more information about this vehicle and confirm its availability. 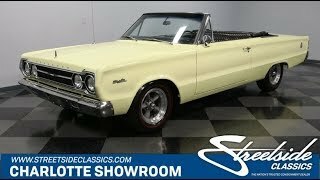 This 1967 Plymouth Satellite convertible has the right combination of originality and great performance upgrades like the 383 V8 and four-speed stick. So from the handsome styling, to the roaring exhaust, this neat droptop is a seldom-seen Mopar that delivers performance and big car comfort in one sleek package. The yellow beige with black top is the exact kind of color coordination that gives this car the right sophisticated first impression. The sheetmetal is nicely creased in the right places, so it doesnt need extra trim to look good. In fact, we love the crisp lines that start at the headlights and flows almost seamlessly along the straight body until they meet the taillights. And speaking of the taillights, they have terrific appearance with the red surrounded by ribbed chrome. This is continued along the back panel for a very harmonious presentation. Its this level of detail that tells you they really paid attention to this one during its restoration. That makes sense considering the rarity barely over 2,000 Satellite convertibles were produced in 67. But more than just look good, the Torq Thrust wheels and redline tires remind you this came from a great era in muscle car motoring. With the touch of a button, the black vinyl roof powers down to reveal a full black interior. So you get the great yellow and black appearance with the top up or down. The seats have a well-defined pattern that really grabs attention. These were midsize cars by 1960s standards, and today that means plenty of room to carry everyone. Thanks to the split-bench up front, the fold-down armrest means more individualized comfort when cruising solo. We know youll love all the great touches on this one from Plymouth logo steering wheel, to the artful gauges, to the original AM radio thats still cranking out tunes. But the Hurst shifter boldly poking out of the floor also tells you there is something special under the hood. The engine bay is filled with Mopar power. Its a 383 cubic-inch big block that the consignor states was installed by a Kentucky performance shop. And it certainly has an aggressive look as the full blackout package comes with the Mopar Performance ribbed valve covers and large air topper. The big V8 inhales deeply from an Edelbrock four-barrel carburetor, and it exhales with authority as long tube headers feed the rumbling dual exhaust. Best of all, you have complete control over this monster motor and its thunderous soundtrack thanks to the four-speed manual transmission. In fact, control is really a central theme to this Mopar. Thats why you have upgrades like newer bushings and thick sway bars front & rear. Plus, theres power steering, front disc brakes, and the grip of BF Goodrich T/As. Heres a rare and powerful Mopar thats also built to be a fine cruiser. This is the distinctive classic for those who like to drive. So something this appealing wont stay long in our showroom. Call now!